Some targets are just too obvious. 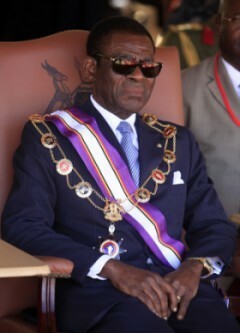 For example, it’s very easy to be sceptical of Teodoro Obiang Nguema Mbasogo, President of Equatorial Guinea since he led a bloody coup against his uncle in 1979. It’s easy to point out the ruthless suppression – arbitrary arrest, kidnapping, systemic torture and life-threatening prison conditions – of any opposition, and the reports of unlawful killings carried out with impunity by his security forces. But, as Benjamin Netanyahu is fond of saying about Israeli bad behaviour, ‘hey, we live in a tough neighbourhood’. There is oil to protect, terrorists to deter, troublemakers to dispatch. Besides which, Obiang is a god, with ‘all power over men and things’, according to the State Radio in Malabo, which also says that the President is ‘in constant touch with the Almighty’ and ‘can decide to kill without anyone calling him to account and without going to hell’. That’s what the political scientists call ‘a strong executive mandate’. When it comes to economic policy, he shows similar acumen. He presides over an African country with an unbelievable (by the standards of sub- Saharan Africa) per-capita income of $30,000, but most of the oil revenues are gobbled up by his family and inner circle. Consequently, 70 per cent of the country’s 680,000 people live below the poverty line, with little access to clean water and other basic necessities. Obiang has also shown great foresight in economic management. Back in 2003, he took control of the public treasury and transferred half a billion dollars into family-controlled accounts at the Riggs Bank in New York – in order, he was quick to point out, to protect the money from civil servants tempted to engage in corrupt practices. Accusing Obiang’s son, Teodorin Nguema Obiang Mangue, of corruption, the US government last year ordered the seizure of his 11 sports cars (worth an estimated $10 million) and $1.8 million worth of Michael Jackson memorabilia, from his father’s luxurious Avenue de Foch residence in Paris. But don’t dare accuse Obiang junior of being a layabout spending his father’s illgotten gains. Teodorin holds down an important job heading up the Ministry of Agriculture and Forestry in his dad’s cabinet, for which he is paid a modest $6,800 per month. And if Obiang senior were really as bad as all that, would he have been elected Chair of the African Union? If he really did think he was god, would he be welcomed to the Vatican as a good practising Catholic by both John Paul II and Benedict XVI? Would Popes who have been so scrupulous in cleaning their own ranks of Leftist liberation theologians and their ilk entertain a mere crook simply because he swung a bit of petro-political weight? And would then-US Secretary of State Condoleezza Rice have called him ‘a good friend’ just a few short years back when Equatorial Guinea offered Muslim-free oil security? Surely not. With all this bad publicity, is it any wonder that Obiang has been forced to put Washington-based PR firm Cassidy and Associates (‘Your Trusted Advisor in Washington’) on a $120,000 monthly retainer? Maybe it was the good folks at Cassidy who suggested to Obiang that he offer an annual ‘Life Sciences Award’, given through UNESCO to five worthy scientists each year, to show what a decent and dedicated fellow he actually is. Until 2008, when the $300,000-a-year-prize was finally set up, UNESCO had for years succeeded in resisting Obiang’s generous offers to fund it. Perhaps they were suffering from shortsighted nervousness about either the provenance of the funds or the failure of the government in question to do much for the health and educational standards of Equatorial Guineans. With UNESCO’s executive board unable to agree whether or not Obiang should be associated with the prize, it has never been awarded. But once he became Chair of the African Union last year, Obiang’s fellow ‘Big Men’ sitting around the AU President’s table showed no such delicacy and demanded the immediate resurrection of the prize. Low cunning: In November 2011 Obiang ‘won’ a referendum, with 97 per cent of the vote, to create a US-style political system complete with a Senate, Ombudsman and the new post of vicepresident – the latter almost certainly earmarked for his son. Sense of humour: Obiang is known for insisting that public speeches end in well-wishing for himself rather than the nation. The face of El Jefe (‘The Boss’ is his name of preference) adorns T-shirts, umbrellas and billboards around the country. Sources: BBC News Africa; Ken Silverstein, ‘Hold That Car’, Foreign Policy October 2011; Business Day Magazine (South Africa); pambazuka.org/en/ category/features/76727; petroleumworld.com; Africa Review 30/01/11; Wikipedia.